Seán Kelly has set up a terrific flickr slideshow of pictures of Deke and Iceberg at the Plough on 17 November 2007. Many thanks to Tony Smith who was at the Briton Ferry gig on February 19 and took some photos... Martin Ace and Gary Pickford-Hopkins also turned up and helped out on the encores. You can see a gallery of photos from the gig in Walthamstow on 22 July 2005. There is also a gallery of photos from the gig in Blackpool on 7 October 2005. 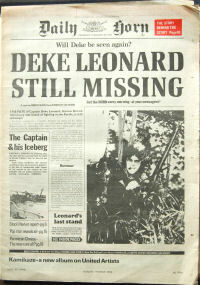 A spoof newspaper was used as an ad for Deke's Kamikaze album back in 1974. Ingeniously printed upside down on the back of the NME, it gave the impression of being an actual tabloid front page. Newswagents throughout the land however, remained unimpressed. If you want to see it in all its glory, and zoom in to read the actual copy, you can download this PDF version, all 871K of it. Thanks go to Mark Davies for the original source material. Here are a few photos from Deke's personal collection, many previously unseen. These black and white photos were taken by Mary Hodge on the same photoshoot as those used on the Freedom and Chains cover.